On March 20th 1999, members of the former North Mymms Local History Society were given the rare opportunity of a guided tour round North Mymms Park and House. 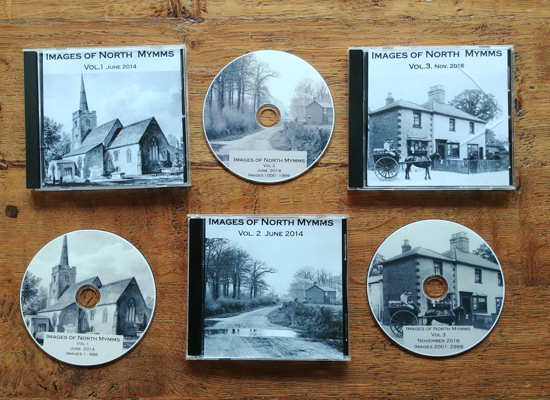 As part of that tour each member was given a pack containing a booklet entitled 'A Short History of North Mymms Park' and a number of photographs of the house and gardens. During the tour, the owners of the house, Glaxo, gave permission for the tour notes to be reproduced in full online. Note: the original document was not illustrated, but we have added related images from the Images Of North Mymms Collection and the Peter Miller Collection with their permission. Four miles from Hatfield and six from St. Albans, close to the borders of Middlesex, is North Mymms Park. The house is a beautiful example of "Jacobean" work, dating from the close of the sixteenth century. Its interior has, however, been re-modelled and altered at various times and it now houses a collection of exquisite tapestries collected by the Burns family and probably unrivalled in this part of England. It is the original Manor of North Mymms from which the smaller Manors of Brookmans, Gobions, Potterells and possibly Parsonage became separated in the late thirteenth or early fourteenth centuries. Simon Swanlond, a wealthy London merchant, became the owner of this original portion and two of the sub-divided manors, by purchase in the year 1316 and a few years later he added the North or Chantry Chapel to the Church of the Manor and it was either he or his son who, about the year 1340, built the Church (except the tower) which exists today. The last of the Swanlonds to hold the property sold out in 1428 to Sir Thomas Knolles, a Lord Mayor and citizen of London, and it was a descendant of his, Elizabeth Frowyck, who, by marrying John Coningsby of Lincolnshire about the year 1530, brought the property to this family and they retained it until 1658. We now come to the close of the sixteenth century; the threat of invasion had passed, thanks to the defeat of the Spanish Armada in 1588 and the increased prosperity of England under Queen Elizabeth was responsible for the era of building palatial houses and mansions on the part of the nobility and owners of manors. 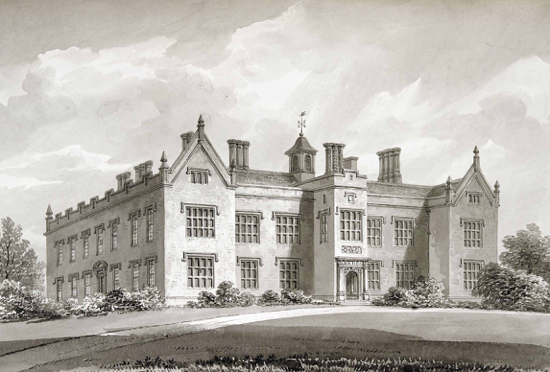 By the year 1590, Elizabeth Coningsby’s grandson, Sir Ralph, had succeeded in the ownership of the Manor. No doubt his position as High Sheriff of Hertfordshire and the contemporary prosperity caused him about the year 1599 to pull down the house of his ancestors which probably stood near the Church, somewhere near where the present vicarage is, and build the house known today as North Mymms. The outbreak of the Civil War in 1642 found Sir Thomas Coningsby, second son of Sir Ralph, not only in possession of the house and Manor but also in office as the High Sheriff of the County, a position fraught with danger to the holder because Parliament, by decree, had declared the office abolished and threatened heavy penalties for any Sheriff contravening the decree. These threats did not frighten Thomas Coningsby, staunch cavalier as he was, so when King Charles wrote from his Court, then at Reading, instructing him to rally the County of Hertfordshire to the royal cause, Coningsby proceeded to St. Albans with a party of the King’s men to read the King’s writ at the Eleanor Cross. At this moment Cromwell, who had recently been appointed Lieutenant-General of the Parliamentary forces in East Anglia, arrived with a troop of horses; after a short skirmish Coningsby was arrested and Cromwell came over to North Mymms and ransacked the house. Sir Thomas was imprisoned in the Tower of London and the Manor was sequestered. About 1650 he was released, no doubt after a heavy fine had been paid. Coningsby died soon afterwards, leaving a family of eighteen children, six sons, and twelve daughters, of whom only one died in infancy. 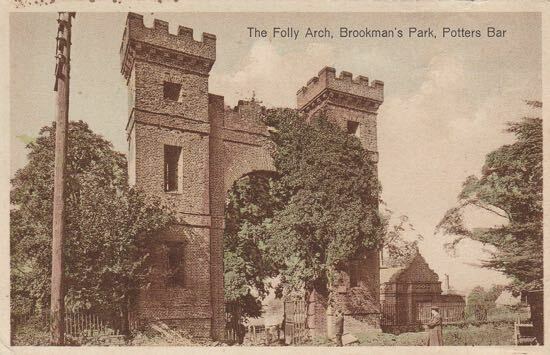 A few years later (1658), his widow Martha and the eldest son, Harry, sold the property to Sir Nicholas Hyde; Martha went to Potterells and Harry Coningsby - he was knighted at the Restoration in 1660 - retired to The Weld, Shenley and so ended the long period of 128 years that this family had possessed the Manor. Sir Nicholas Hyde, the new owner, had a grand-daughter Bridget, her father’s heiress. She married the eldest son of Earl Danby - the well known minister of Charles the Second who was later created Duke of Leeds. In 1685 Bridget succeeded to the estate and a few years later her husband, Peregrine Osborne, became the second Duke of Leeds and it was with this family that the ownership remained until the year 1799 when the sixth Duke disposed of the property to Henry Browne. Throughout this long period (114 years) their occupancy of the house must have been very intermittent and they probably let or leased it at various times. 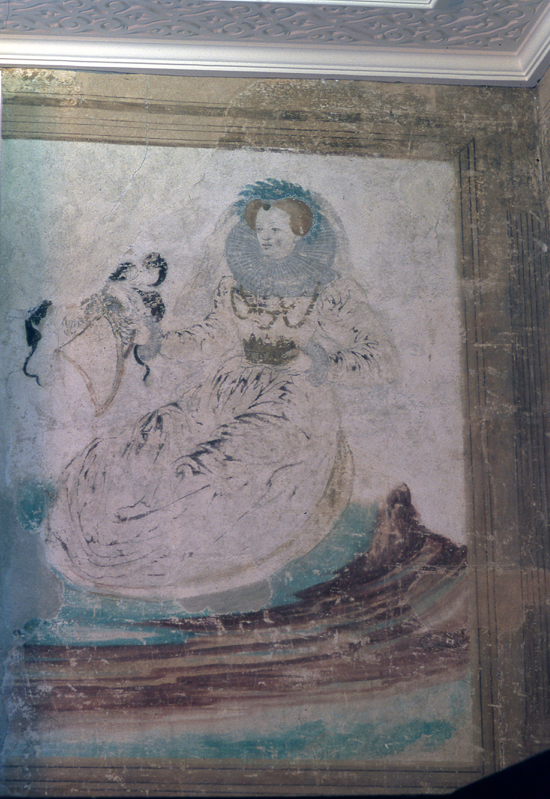 For instance, Lady Lydia Mews was resident at the time of her death in 1751 and her mural monument as well as those of her father and other members of the family (the Jarvises of Islington) can be seen in the north aisle of the Church. In 1823 it appears Henry Browne sold out to Sir William Heygate who held it for a short time and it was acquired by the Fulke-Grevilles, later Baron Greville, and it was during their ownership that the two-storeyed corridors and flanking turrets with their copper-covered ogee caps were added to the East and West Wings - viewed from the South side - this was during the years 1846/7. Forty-four years passed and another change in ownership took place when Coningsby Sibthorp purchased the estate; this gentleman was a descendant on the female side of the Cavalier Coningsby of King Charles' day; he already owned Potterells and thus he, for a period, reunited two portions of the original Manor. Two decades passed and a family named Bruce came on the scene, but they held it only as a speculation and after four years had elapsed, in 1893, it was sold to Mr. and Mrs Walter Hayes Burns and they immediately commenced extensive alterations not only to the interior of the house but also by adding several wings to the West side. The latter, however, were practically all removed in 1947 by the then owner Lt. Col. W.A.G. Burns, MC, DSO but he at the same time made additions to the interior, such as old panelling to the new Dining Room. Careful alterations were made to the older work to make it more suitable to present-day needs. 10’4" x 17’10" - attributed to Pieter and Frans van der Borght, after David II Teniers. Woven in blues, reds and verdue tones, groups of peasants are making merry, eating, drinking and dancing outside an inn with rustic buildings on the left and a pond in the foreground overhung by trees, with a distant landscape in the background. It has a picture frame border with a Brussels town mark bottom right. 10’4" x 12’6" attributed to Pieter and Frans van der Borght, after David II Teniers. Milkmaids are at work with their herd, pouring the milk into jars and cleaning churns, with a flock of sheep in the foreground, in verdure landscape with rustic buildings and trees. It has a picture frame border with Brussels town mark bottom right. Emblematic of Autumn in verdure tones heightened with red, the grapes are being trodden in a large barrel with gatherers coming forward with baskets and pickers on the right overhung by trees with buildings in a landscape behind. In the manner of Bernard van Orley. Each in four-sided palm trunk border with trophies of fruit and flowers and various birds of prey. Herculean and the Nemean Lion 12’ x 10’3"
The first Labour of Hercules, the background with subsidiary scenes including Hercules receiving the commands of Eurystheus and Hercules using the fork of a tree to skin the lion. With Brussels town mark. After Hercules, in a fit of madness, had slain his wife and children, the Delphic oracle commanded him in punishment for his crime to go to King Eurystheus and to perform whatever tasks might be demanded of him. The First Labour of the Twelve Labours of Hercules was to bring him the skin of the Nemean Lion which Hercules strangled with his bare hands. Future episodes in the series show Hercules wearing the lion skin. Herculean and the Stymphalian Birds 12’ x 10’3"
The Sixth Labour of Hercules. Hercules is pointing a bow and arrow at the birds on the ground. Brussels town mark. Hercules and Cacus 11’ x 14’6"
The Tenth Labour of Hercules, in the left background subsidiary events from the eleventh Labour, with the Hesperides guarding the golden apples assisted by the dragon Ladon which is slain by Hercules in his attempt to obtain possession, and to the right Hercules lifting Antaeus and squeezing him to death. With Brussels town mark bottom left. The Tenth Labour of Hercules was the Capture of the Oxen of Geryones in Erythia. Many attempts were made to deprive Hercules of the oxen, notably by Cacus, a giant who lived in a cave on Mt. Aventius. Cacus stole some of the cattle and attempted to conceal their traces by dragging them backwards by their tails into the cave. As the other cattle passed the cave those within started to bellow and were thus discovered, whereupon Cacus was slain by Hercules. The Eleventh Labour of Hercules. Lifting Antaeus from the ground and squeezing the life out of him, watched by lolaus, the background with subsidiary scenes, including Hercules and Cacus and the Stymphalian birds. The Eleventh Labour of Hercules was the Fetching of the Golden Apples of the Hesperides. These had been given to Hera by Ge and entrusted to the keeping of the Hesperides and the dragon Ladon in the country of the Hyperboreans. In his quest Hercules encountered Antaeus, a Libyan giant, whose strength derived from contact with his mother Ge, goddess of the earth. When strangers came to his kingdom he would wrestle with them and if thrown would gather renewed strength from contact with the ground. Realising this Hercules lifted Antaeus off the ground and squeezed the life out of his body in a tight hug. The Eleventh Labour of Hercules, supporting the globe with Atlas seated beside him and lolaus standing to the left, the background with subsidiary scenes including the fourth Labour of Hercules and the Capture of the Erymanthian Boar. In the course of his quest for the Golden Apples of the Hesperides, Hercules sent Atlas to fetch them and in the meantime agreed to bear the weight of heaven for him. On his return with the Apples Atlas refused to take the burden of heaven upon his shoulders again but Hercules contrived by a stratagem to gain possession of the Apples and departed. 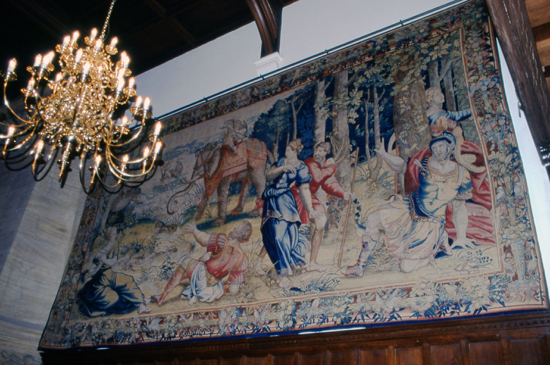 Two of a set of Brussels mythological tapestries, mid 16th Century, after Bernard van Orley. Each in four-sided border with various birds among trophies of fruit and flowers fastened to palm trunks. To the left Aegialea and a stricken suitor with the accusing Venus with bearded companion, to the right the fallen figure of a warrior struck by Cupid’s arrow who fires it from astride an elephant, the background with mermen riding sea monsters. Venus saves Aeneas from the onslaught of Diomedes 12’2"x 12’10"
In the background Venus (Aphrodite) pursued by Diomedes. Depicting an interior scene, the broad sculptural border woven with reclining figures of Night and Day above flanking a flaming urn and the corners with owls. The side borders with emblematic figures of the four seasons divided by bearded satyrs contained in grotesque C scrolls, the lower border with further emblematic figures and a central log-filled lion mask furnace. Depicting figures in a garden beside a lake, in broad sculptural border woven with birds and flowers and allegorical figures, the sides with youths climbing palm trees and the top border with a flaming lamp. This is woven in well-preserved wools and silks with Romulus presenting to his grandfather, Numitor, king of Alba Longa, the severed head of his usurper brother, Amulius. In four sided compartmented floral border with illustrations of latin proverbs and allegorical and mythological figures, including Hercules wearing the skin of the Nemean lion and Hercules and Nessus the centaur, the lower corners with Jupiter and Juno and Mars, Venus and Cupid. All have well preserved colours within broad pergola and colonnaded borders with allegorical biblical vignettes, fruit and flowers. Mark Antony wrapped in a Victor’s Cloak 11’2" x 8’5"
Cleopatra Kneeling before Caesar 11’2"x 13’l"
Caesar and Cleopatra Enthroned 1 1’2" x 8’6"
Depicts a colonnaded dais in the background with figures and animals in the foreground. The Offering of the Crown 11’2" x 15’3"
The army in the background and a kneeling figure in the foreground. The recent discovery of the wall-paintings known as The Nine Worthies at North Mymms Park has rightly been called ‘one of the most significant and exciting art finds of the Century’. It came about in the following manner. By the time Courage acquired the house in 1987 it had fallen into a sad state of disrepair. The previous owners had taken little interest in it and never lived there. On their departure they failed to secure at least one major water outlet and for the many months that the house stood empty water was dripping through the building unchecked. Not surprisingly, when the property was opened up to begin renovations there was evidence of dry rot. The problem had been chronically exacerbated by the months of dripping water. One afternoon - and quite without warning - the great central beam of the house broke in two, sending, as one witness remembers, ‘a great shudder through the whole mansion’. One result of this convulsion was to send the floor of the Mymms Room crashing through the ceiling of the billiard room below, ripping away a part of the fine Edwardian pine panelling in its descent. This was at first thought to be a great tragedy. It ultimately proved a blessing. One day, shortly after repair work got under way, a workman removing lathe and plaster underlay, said ‘There’s a face looking at me from the other side of the wall’. One of the Nine Worthies - Godfrey of Bouillon - was about to emerge from his hiding place for the first time for many years. How he and his companions came to be painted or why they were afterwards covered over ... nobody knows. They are certainly very old and probably as old as the house itself, which was constructed about 1595. Painstaking clearance, sometimes no more than an inch at a time, ultimately revealed a frieze banding the entire room, depicting twelve figures painted on dry plaster. The degree of damage varied greatly. There had been a serious loss of plaster where wedges had been driven into the walls to secure the former panelling. There were also instances where the plaster appeared to have been forcibly ripped from the walls. Why the paintings had been covered up - and with such apparent lack of care -remains a complete mystery. Equally mysterious is the total lack of information regarding the murals either in documents referring to the house or in books on English wall paintings. Preserving them for future generations proved a major undertaking fraught with potential disaster at every turn. In the years since their concealment all the paintings, executed on a base of coarse lime and sand, had accumulated a considerable amount of surface dirt. Due to the combination of damp, and the failure of the original binder, the pigments were fragile, sensitive to touch and liable to crumble under the slightest pressure. The successful restoration work took six months to complete. The operation involved removing the surface dirt, stabilising the fragile pigments, filling in the missing sections of plaster to match the original colour and texture, and retouching and reconstructing the damaged and missing sections. Because they are not represented here within these groupings, we must look both at the painting and the life of each Worthy as we encounter them, beginning with Charlemagne who has here usurped Hector’s place and leads the Worthies. The text from this point deals with each of the paintings by turn, beginning with Charlemagne. In this depiction, Charlemagne is shown with a full beard. He wears an ermine-lined over mantle, richly decorated, which also covers the rear of the horse. In his left hand he holds the sceptre denoting kingship. In his right hand he holds the sword ‘La Joyeuse’. Charlemagne is one of the immortal figures of history - a conqueror, a law-giver and an Empire-builder. Standing as he does at the watershed of time - where classical civilisation ends and Middle Ages begin - he casts a long shadow over eleven centuries. Since the fall of the Roman Empire three centuries earlier, Western civilisation had been without a rudder. It had slowly drifted into barbarism and anarchy. Charlemagne changed all that. The son of Pepin the Short, who had seized the throne of the Franks from the ‘do nothing’ Merovigian puppet kings, Charlemagne proved a tireless warrior, one moment overthrowing the kingdom of Lombardy, the next suppressing an insurrection in Italy. In 800 he lent his support of Pope Leo Ill against the rebellious Romans and on Christmas Day 800 was crowned by the Pope Emperor of the Romans. The remaining fourteen years of his life were spent in consolidating his vast empire. From the Baltic Sea to the Spanish marches, from the tip of Brittany to the lower Danube, the Emperor of the West held sway. He was, however, a great deal more than a soldier, he was a great Christian king. With a sword in one hand and a cross in the other, he sought to banish ignorance and superstition, greed and treachery. He was patron of the arts and took a keen interest in the causes of agriculture, education and commerce. Learned men were encouraged to come to his court and he himself spoke Latin and read Greek. His fame ultimately spread to all parts of the world. The half-legendary King of the Britons is shown here looking ahead, but with his body twisted to his right. He carries a pennon which unfurls behind him. The horse has its front leg raised and the hind legs extended, as though in a gallop. Perhaps the most romantic figure in English history, King Arthur stands, like Charlemagne, as a symbol of chivalrous Christian resistance to the barbarian hordes. A multitude of fascinating legends have become associated with his person, notably those of Camelot, the Round Table and the Holy Grail. He is first mentioned by Nennius in the 9th Century. ‘The warlike Arthur with all the kings and armies of Briton fought the Saxons. Many were nobler, but he was twelve times chosen general, and triumphed twelve times’. Arthur was ultimately slain in battle by his treacherous nephew, Mordred. His body was mysteriously transported to the island of Avalon from whence - it is said - he is one day expected to return to restore ‘the rule of right’. Whether he ever really lived is a vexed question. Perhaps all that can really be said (in the words of one old writer) is that it is ‘not all a lie nor all true, not all fable nor all known - so much have the story-tellers told and the fablers fabled, in order to embellish their tales, that they have made all seem fable’. In the painting here, Caesar holds a pennon in his right hand showing the Imperial Roman eagle on an argent field. In his left hand he holds the metal studded reins of his horse. The saddle has a high cantle, firmly holding the rider in place. The breastplate is little more than a simple medallion. The helmet is a classicised burgonet with plumes. Like Charlemagne, Julius Caesar could be said to have laid the foundations of Western civilisation. By birth a patrician, he was perhaps the greatest genius Rome ever produced. Having begun life as an advocate, he later turned to politics and was elected governor of Farther Spain. He was elected to consul in 59BC and in the course of the following nine years waged war against Gaul. In 49B0 he was ordered to disband his army. Instead of doing so he led his faithful Legion across the little river Rubicon which separated his Gallic province from Italy. In doing so he committed himself to an irrevocable course of action and ‘to cross the Rubicon’ has since entered the language as a synonym for making a commitment from which there can be no withdrawal. Following Julius Caesar is the Jewish Champion, Judas Maccabees (or Macabeus), seated in a saddle comparable to Caesar’s. He carries a pennon with four tails showing argent two crows sable. He is full bearded. His cloak hangs out from his shoulders. Details of the boot are lost, except for the thick protective leather top. Judas Maccabees came from a celebrated Jewish family. When his father, Mattathias, an aged priest, took to the mountains following Antiochus Epiphanes’s attempt to impose the Greek religion on the Jews, Judas became a guerilla leader. He proved to be a military genius. He eventually repulsed the enemy, reconquered Jerusalem, purified the temple and re-inaugurated the Holy service, a deed celebrated to this day in the Jewish festival of lights, ‘Hannuka’. When Antiochus died, the Jews were offered freedom of worship. Judas Maccabees chose to fight on, hoping thereby to gain political freedom for his people as well. He was killed in battle in 161 BC, but his younger brothers took over the fight and ultimately secured independence for Judaea. Outside the Jewish community, Judas Maccabees is best remembered today for his immortalisation by Handel, who in 1746 composed the oratorio, ‘Judas Maccabeus’. Not discounting the ‘Messiah’, it was the first of the composer’s works to find complete popularity in England. It won him great favour and he died - loaded with honours - thirteen years later, in 1759, aged seventy-four. Moving on to the south wall we come to Alexander the Great, King of Macedonia, seen here wearing a turban and carrying a pennon featuring a golden lion seated in a chair. 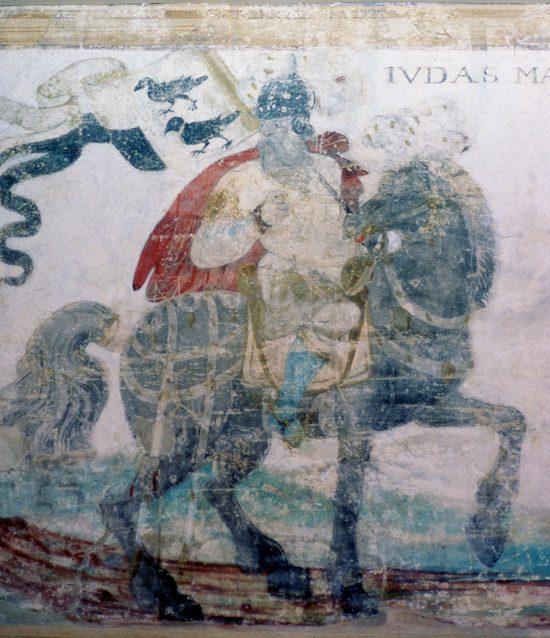 He is riding his famous charger, Bucephalus. Alexander had an early introduction to statesmanship being only sixteen when his father, King Philip, marched on Byzantium, leaving Alexander behind as Regent. Four years later Philip was assassinated and Alexander succeeded to the throne. Having crushed the rebellious lllyrians and razed Thebes to the ground, he won a great victory over the Persians at the River Granicus. Despite inferiority of numbers, he next met and utterly defeated Darius. After seven long months he took Damascus and destroyed Tyre, perhaps his greatest military victory. He then made a triumphal progress through Palestine. The Egyptians - who had never taken kindly to Persian rule - hailed Alexander as a deliverer and here in 331 BC he founded the city of Alexandria. Babylon and Susa, the great treasure houses of the East, opened their gates to him and in 329 BC he overthrew the Scythians on the bank of the Jaxartes. In 326 BC he proceeded to the conquest of India, until that date a totally unknown continent. After marching through the Punjab, establishing Greek colonies, he fought his way to the ocean, losing three quarters of his force in the process. One of the greatest generals that ever lived, Alexander was still making gigantic plans of conquest when in 323 BC, at Babylon, he was taken ill following a gargantuan eating and drinking bout. He died eleven days later and was laid to rest in a golden coffin at Alexandria. He was just thirty-four years old. As with the Emperor Charlemagne, his empire did not long survive his passing. It was quickly divided up between his generals, none of whom possessed either their master’s military capability or his talent for colonisation. Following Alexander is David, the first king of the Judean dynasty of Israel, who in youth distinguished himself by slaying Goliath. He is depicted here looking downwards, carrying in his right hand a pennon, the sharpened end of which doubles as a lance. He wears a spiked crown and his cloak swirls out behind him. The saddle is like those seen before. Having begun life as an aide to King Saul, Israel’s first king, David’s abilities were quickly recognised. Saul appointed him to a military command and gave him his daughter, Michal, for a wife. However, the very abilities which had raised him to prominence soon began to arouse the jealousy of Saul. Fearing for his life, David fled to the coastal plain where for some time he lived the life of an outlaw, commanding a troop of four hundred freebooters. He found favour with the local populace by protecting them from other bandits and won the good opinion of many Judean elders by various political gestures. He also managed, very shrewdly, to retain throughout this time his status as a patriot in the eyes of the common people. Consequently, when Saul was killed in battle David was invited to become king. He ruled jointly with Saul’s son, lshbaal. When Ishbaal was murdered by his own courtiers, David became sole ruler of Judea. He conquered the then independent city of Jerusalem, establishing his palace on its highest hill, Zion, (or the ‘City of David’). He also placed here the Ark of the Covenant, under a tent. 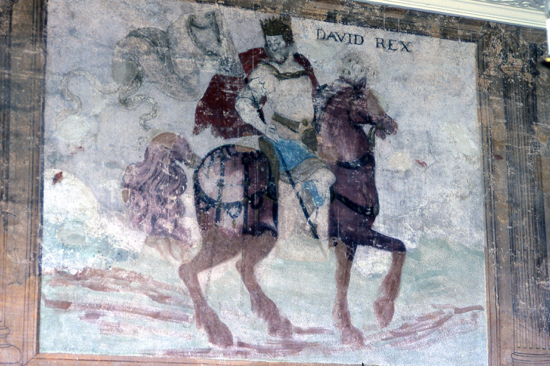 In the course of his thirty-two year reign, King David won a number of important military victories, but his last years were marred by the constant efforts of his two sons to overthrow him. The greatest of the Kings of Israel, he died about 1,000 BC. He was an accomplished composer and wrote at least some of the psalms which we still sing today. ‘Glorious Hector, the eldest son of King Priam and the ideal hero of the Trojans, should be the leader of the Worthies. His helmet, a classicised burgonet, is presumably the one which, during the siege of Troy, so frightened his infant son, Astyanax. According to the ‘Illiad’, Hector’s wife, Andromache, had come with the child to try and persuade Hector not to return to the fray. Hector could not agree, but in a gesture of conciliation stretched out his arms to his infant son. Frightened by the gleaming bronze of his fathers muscled armour, and the horsehair crest which nodded fiercely from his helmet, Astyanax shrank back in tears. Laughingly, the great warrior swept the helmet from his head, took his son in his arms, kissed him ‘and prayed to the Gods that he might grow to be a great man’. Unfortunately - at least for Hector - the Gods were not on the side of the Trojans that day. he had an initial success when in a skirmish he killed Patroclus. But Patroclus had been a much-loved friend of Achilles, the greatest of all the Greek warriors, who immediately swore revenge. Achilles re-entered the fight with renewed vigour. The tide turned against the Trojans who fell back upon their beleaguered city. The massive portals closed and all the Trojans were safe inside save Hector, who stood outside the wall awaiting the coming of his greatest enemy. Hector was unquestionably the finest of the Trojan warriors. He was no match for Achilles. Following an ndignified chase around the walls of the City he was killed by a single thrust of his opponent’s sword. To take full vengeance for the death of Patroclus, Achilles fastened the body of Hector to his war chariot and ragged it round the wall of Troy (and past the tomb of Patroclus). Andromache fell fainting into the arms of her maidens as she stood on the wall and looked upon the dishonour done to the body of her husband. Although Achilles was disinclined to give up his trophy, he was ultimately persuaded to do so in return for ‘gold rugs, mantles and cloaks and cauldrons. The two sides then entered upon a nine-day truce during which the Trojans mourned their fallen hero. They burned his body on a lofty pyre and buried the bones beneath a great mound of stones. So passed the chief warrior of the Trojan army - a good son, a loving husband and a trusty friend. At one point he actually managed to drive the Greeks back to their ships and almost succeeded in burning them. Had he not encountered Achilles - a veritable superman - the outcome of the siege of Troy might have been very different. Although only the word ‘DUX’ is decipherable in the next painting, we know that this refers to the prophet, Joshua, a charismatic warrior, who during the forty years’ wanderings of the Israelites in the wilderness, acted as ‘personal assistant’ to Moses and - after Moses’ death - was expressly charged by God to lead the Israelites into Canaan following the Exodus from Egypt. The biblical Book of Joshua provides a narrative account of the settlement of ‘the Twelve Tribes’ in Canaan under his leadership. The last - but no means least - of the Worthies, is the crusader Godfrey of Bouillon (alternatively Godefroi De Bouillon). He is in many respects the odd man out. He is depicted travelling in the opposite direction to his companions; he holds his sword in a manner which suggests that he is in the midst of a battle, and he looks out in a way that almost invites us to participate. Unlike his companions, he wears clothing of a later period. This has led to the theory - impossible now to substantiate - that he may have been fashioned in the image of the owner of the house, the commissioner of the fresco. The real Godfrey of Bouillon was also something of a misfit. Born about 1060 in Lower Lorraine, the son of aristocratic parents, he was impelled by a strong religious urge, a craving for adventure and his failure to adapt to the life of an administrator of family estates to join the first crusade in 1096. Tall, handsome and fair-haired, he was by coincidence a descendant of another Worthy - Charlemagne. When Raymond of Toulouse - the lay leader of the crusade - declined to become King of Jerusalem, Godfrey accepted the crown in his place. However, he refused the title of king and was called instead ‘Defender of the Holy Sepulchre’. Despite his weakness as a ruler he was later idolised in legend as the ‘perfect Christian knight, the peerless hero of the whole crusading epic’. The three remaining paintings which complete the wall frescoes are difficult to decipher. The tenth male figure, complete with 16th Century armour and a ruff, has not been identified. Like Godfrey of Bouillon, he may be the owner of the house. Despite the anachronistic apparel, he may also be the shadowy Guy of Warwick, a hero incoherently embodied in several Anglo-Saxon traditions of the tenth and eleventh Centuries. The son of Wigod, cupbearer to Edward the Confessor, Guy of Warwick is in every sense larger than life. For many years his ‘porridge bowl’ was displayed at Warwick Castle. It had a capacity of twenty gallons. In Hampole’s prologue to ‘Speculum Vitae (c.1350) he is described as ‘Sir Gye of Warwike a knight of grete renowne’. In order to win his bride, Felice - a daughter of Rohand, Earl of Warwick - who doubted his valour, Sir Guy fought the Saracens at Constantinople, slew a dragon laying waste to Northumberland and despatched the Viking giant, Colbrand. Rather surprisingly (given that he had gone to all this trouble) he retired shortly after his marriage to a cave in the woods of Arden to lead the life of a hermit. He kept his whereabouts secret from his wife who only tracked him to his lair - as he lay on his deathbed - by means of a ring given to her by a herdsman. She survived her husband just fourteen days. According to legend, Guy’s descendant, Earl Richard of Warwick, identified the hermit cell and converted it to a shrine. This tenuous connection with the later Earls of Warwick may have given rise to the unlikely theory that the tenth figure in the Worthies procession was not Sir Guy of Warwick but John Dudley, Earl of Warwick and Duke of Northumberland (1502? -1553), who on the death of the boy-king Edward VI endeavoured to secure the succession to his own family by placing his fifteen year old daughter-in-law, Lady Jane Grey, on the throne of England. He was outwitted by the righfful Queen, Mary Tudor, and paid for his presumption with his life. The identity of the female figure wearing on her head a laurel wreath and proffering a crown is less problematical. She is almost certainly Fortune. Fortune could forsake her favourites (Alexander the Great was struck down prime, as was Julius Caesar). She was a dichotomy of Good and Evil, sitting wheel doling out rewards and punishment - proffering with one hand a crown with the other scattering flowers, emblematic of folly. The winged female figure to Fortune’s right, appears to be leading the procession and is labelled ‘Fame’. The Victoria & Albert Museum describes her as being dressed in the height of fashion for the 1580s with an open ruff and full sleeves tapering to the wrist. Her small waist is emphasised by full rounded hips created by a ‘bum roll’ under her petticoat. Her hair has been centrally parted, then tightly curled and finally brushed away from her face. The distinctive high forehead of the period has been achieved by shaving back the hairline. She holds two trumpets, one for ‘good’ and one for ‘ill-repute’. She blows the one to which a banner attaches. It may be that this emblematic figure of Fames is Queen Elizabeth, included here among the Worthies by order of the house’s owner in the hope that she might one day be prompted by vanity to visit the property to view her likeness. Did she ever do so? It’s all a mystery .... as so much else concerning her, but there are some grounds for supposing that she did . She was unquestionably vain - as witness the fantastically elaborate dresses and jewels and she was also familiar with the area. In March 1536, when she was just two years old, her mother Anne Boleyn was executed. Shortly afterwards Elizabeth was declared illegitimate and removed from Court. 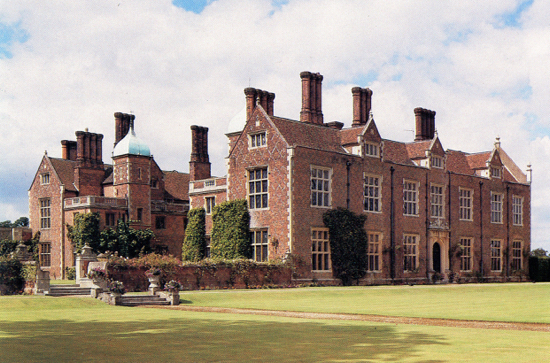 She spent most of her childhood at Hatfield House, a short distance from North Mymms Park. Throughout her reign Elizabeth embarked on frequent ‘royal progresses’ availing herself of the hospitality of her wealthier subjects. It is an established fact that she tried to control all royal portraits and she may well have wished to vet the one here. The figure of ‘Fame’ is dressed in the height of upper-class Tudor fashion, has Elizabeth’s high-shaven forehead and - as one would expect of a queen - gives the impression of leading the procession. The allegorical title of the portrait does not preclude it from being a true representation of the Queen. Painters such as Nicholas Hilliard celebrated her in a variety of mythological and allegorical guises -as Diana, the chaste goddess of the moon, Astraea, the goddess of justice and most famously - as Gloriana, queen of the fairies. Further wall paintings were discovered in a first floor bedroom in the West Wing when fabric that had been attached to wooden struts above panelling was removed. The painting gives the impression of a carved marble frieze, an effect that has been achieved by the painting-in of shadows as if natural light from the windows fell on a moulded form. 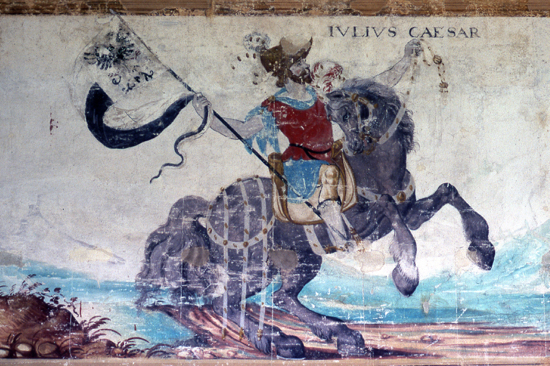 The painting would originally have formed a frieze around the entire room but now only remains on the south and west walls. The frieze is punctuated by large strapwork cartouches enclosing coat of arms. The style of the painting indicates a 17th Century date, although the coat of arms were probably painted-in during the 19th Century. 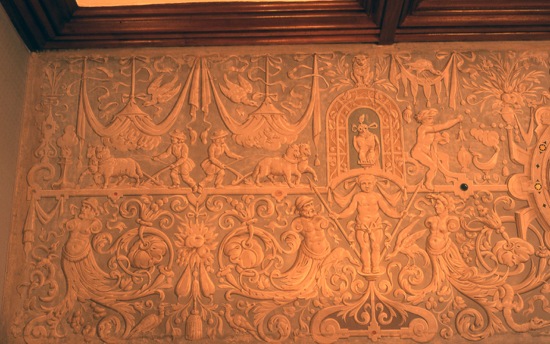 Beneath the panelling in the Marble Hall lies a frieze known as grotesque work. Grotesques were painted decorations and sculptures with animal forms fantastically interwoven with foliage and flowers. The decoration was popular throughout Europe during the 16th Century. The grotesques in the Marble Hall were probably painted at the same time as the Worthies in the adjacent room are therefore dated at about 1595. Circular top edged with egg and dart on three lion monopodia with clawed feet. One leg inscribed "Newby Hall, Yorkshire". The egg and dart moulded cornice and leaf incised frieze above three florally inlaid recessed panels with balusters, the similarly inlaid and carved base with two drawers and two panelled doors, inscribed 1674. Cleated four plank top above twelve gun-barrel supports with oblong stretchers and bun feet. Fitted with a frieze drawer. The bases are richly cast and chased with foliage and blooms and applied with arms, the stems decorated with boar and cherub masks, shells and scalework. Two geometrically panelled doors enclosed an arrangement of drawers upon a stand with twist turned legs and a panelled drawer. Veneered in burr walnut with mouldings of cross grained walnut. Original eight-day weight driven movement, striking the hour with a bell.